Two Gowrie Care services recently held a coffee morning in Dundee to raise over £200 for Maggie’s Dundee. Service users from Gowrie Care’s Milton Street and Canning Place services invited their families to the get-together where they enjoyed hot beverages, home baking and a good catch up. They managed to raise £218 for the charity which provides free practical, emotional and social support to people with cancer and their family and friends. 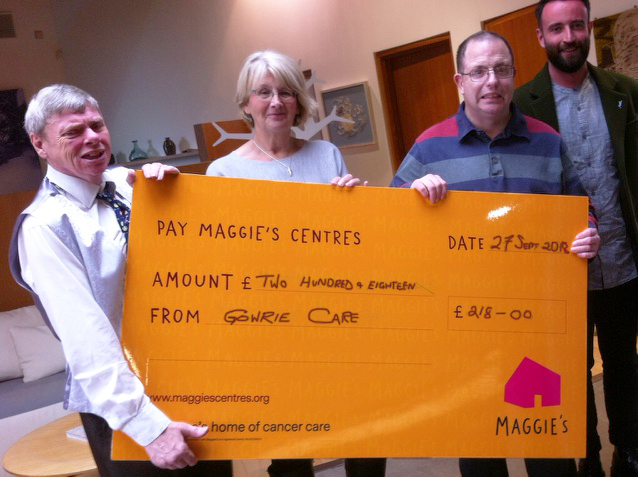 Paul Cox from Canning Place and Tom Fotheringham from Milton Street visited the Maggie’s Centre in Dundee with their support worker, Michael McGuire to hand over the proceeds.